In the first piece on this disc the terrain is America, or more specifically its folk regions, and the piece falls into a category of works by Butler (earlier examples include Hootenanny, Down-Hollow Winds and Bluegrass Variations) that draw on aspects of that country’s folk music. 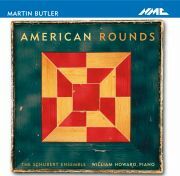 No actual melodies are quoted, but each movement focuses on, in the composer’s words, ‘a tiny amount of highly characterised musical material derived from the scales, gestures and performing practices of different American folk idioms’. They are ‘little folk games’, as Butler has it in the title of the short piano pieces which are remade as the first two movements here – another instance of difference amid repetition. Butler’s teacher Berio is remembered in the piano quartet Sequenza Notturna, written in the month after his death in 2003. The piece revives several preoccupations which were prominent in Butler’s earlier work: notably the idea of a thread of melody, sometimes audible, sometimes hidden but controlling aspects of the harmony or structure. In Sequenza Notturna the thread is initiated by a repeated-note figure in the viola, serving a similar function to the dotted-note melody in Funérailles, though here it enters earlier into proceedings and quickly ramifies to impel the piece onward through a sequence of episodes including a ‘ghostly sarabande’ unfolding in gentle heterophony, a quicker, energetic folk-like dance, and an impassioned recitative for all three string instruments in unison which, the composer has suggested, locates this evocatively nocturnal piece somewhere in Moorish Spain. The principle of a guiding thread of melody spanning the piece relates closely to Berio’s own working methods, and instances in the older composer’s oeuvre also give a precedent for its metaphorical association with the image of a river. Thus the river becomes in Butler’s work a metaphor for Berio, too, and a poetically apt one at the quiet end of the piece, to which Butler appends the phrase (from Larkin’s The Whitsun Weddings) ‘… somewhere becoming rain’ – rain, of course, being what happens to rivers when they leave the earth.